Even though I’m not a scientist, I see more and more connections between our Budō and the world of Quantum physics. During Nagato sensei’s class this was obvious, once again, as every movement is a natural reaction to uke’s intention. The way you “observe” the situation, influences the outcome of the fight. We can rewrite the previous sentence as follow: “Tori is the observer, that constitutes the final link in the chain of observational processes, and the properties of any movement, can be understood only in terms of the movement’s interaction with the observer. Rachel, a new Shidōshi from the USA, opened the class with Sōke kind of Omote Gyaku and Nagato sensei broke it down in numerous henka. When he used her as uke, each attack she gave was slightly different from the previous one. But each time, Nagato sensei, sensing the subtle changes, was able to turn it into some kind of Omote Gyaku. Clearly, he was observing without any intent, and therefore was able to react according to the new situation. Hatsumi sensei often says that he “never repeat twice the same technique.” we witnessed it yesterday. In the fight, Tori is “kansokusha”, the observer, meaning that he is passive and has no intention. (1) Tori moves slowly and unfolds the possibilities offered by uke. Nagato sensei spoke again about the importance of not using strength (2), and to move slowly. The technique we use doesn’t matter. It is determined by uke’s attacks. There cannot be any preconceived choice. Slow motions paired with proper distancing will unfold our possibilities. To illustrate further this, Nagato sensei applied the same body flow with a Hanbō. The original Omote turned at time into Oni Kudaki, and at other times into Musha Dori. But he kept calling it Omote Gyaku. 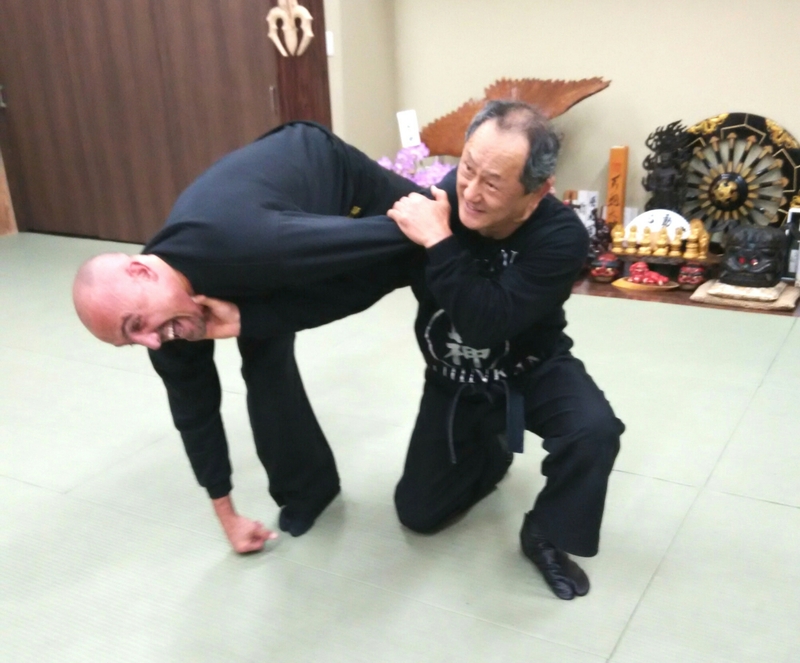 These days, I see “Waza” as the worst weakness of the Bujinkan practitioners. Because we want to do, we stop observing and cannot interpret the subtle changes happening before our eyes. Willing to do a waza, we cannot observe anymore. Not observing, there is no awareness. And without awareness, we cannot adapt freely to the situation. Hatsumi sensei’s Budō is not about techniques, it is about life. Only when we become 観測者 (kansokusha), an observer; we can turn into 感覚者 (kankakusha), a man of feeling.